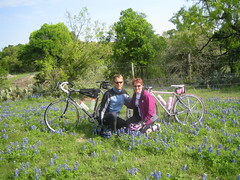 The Easter Hill Country Tour is supposed to be 3 days of wonderful cycling in the Texas Hill Country. Well, this year the weather conspired to make that only one day of wonderful cycling. Friday was fantastic, but on Saturday and Sunday, we were treated to an unusual snap of cold weather. Our blue skies were replaced by freezing rain and sleet. Not the best of conditions for cycling. Still though, we made the most of the time we were able to get out. You can check out a Flickr slide show and a few more pictures here. 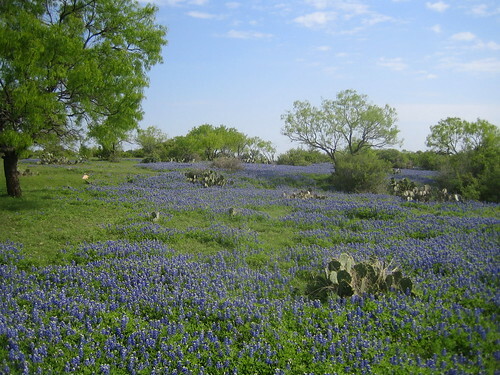 Some of the fields of Bluebonnets along Friday’s route were just amazing. The picture below was taken just south of Enchanted Rock State Park and was one of the better roadside displays. The flowers stretched on as far as you could see.